Segment provides the infrastructure you need to deliver your data from point A to point B. To earn your trust, we know you need as much transparency as possible into what happens with your data along the way. That’s why we’re launching two new features to help you get more visibility into your Destinations. Segment’s new data visibility features — Event Delivery and Event Tester — empower you to easily identify and resolve data delivery issues as well as test connections between your Sources and Destinations receiving data server-side. With Segment’s new Event Delivery feature, you can go beyond our platform-wide status page to view the specific deliverability rates for your very own Sources to your own Destinations directly in the Segment app. Should Segment encounter any issues when attempting to deliver your data — whether from a network timeout, a Partner API rejecting the call, rate limiting, or anything else — we will report them in real-time. You can also see the latency of your data and specific details for each error that has occurred. 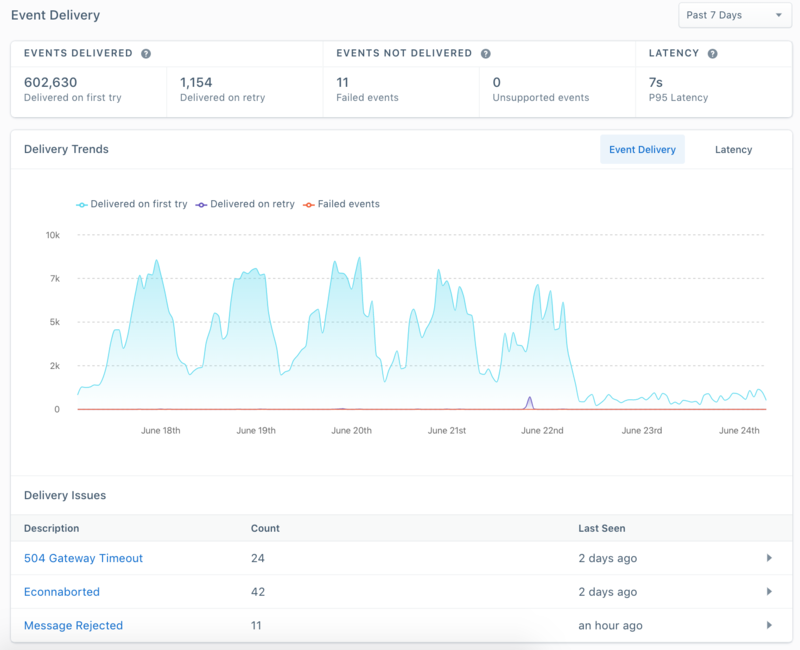 With Segment’s new Event Delivery functionality, you can see firsthand which errors are occurring, why they’re occurring, and what you can do about it — even if they are not Segment-related errors. This gives you more visibility into data deliverability than you’d get within most partner applications. For example, let’s say you notice some of your events are missing from your Google Analytics dashboards. You pipe your customer data to Google Analytics through Segment, so you’re not sure if the issue is originating in Segment, Google Analytics, or somewhere else all together. Or, perhaps you weren’t even aware that some of your customer data wasn’t being delivered at all. You can now use the Event Delivery tool to find out about any errors that may have otherwise allowed your Destinations to fail silently. For instance, it may be the case that your data is failing to make it to the Destination because the call you are sending to us is referencing a URL that has been changed or no longer exists. In this case, we will surface a 404 Not Found error response from the Destination partner, along with up to 10 sample payloads where you can investigate the exact resource missing and identify recommended fixes. Event Delivery also highlights Segment’s retry logic. Behind the scenes, Segment retries your events up to 9 times to increase the chances of your customer data making it to its end Destination. With Segment, more of your data will be delivered than without because of our retry algorithm. If your data isn’t successfully delivered the first time due to temporary issues with the data—for instance, you’re being rate limited or the Partner API is down—we will retry it for you up to 9 times to maximize the chances that your data is successfully received. 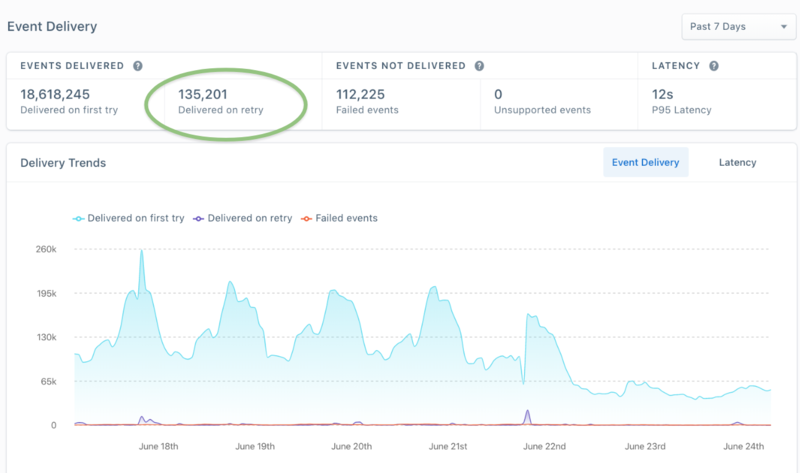 When we report on Event Delivery, we break out the events that were successfully delivered on the first attempt versus on a retry, so you know when your data arrived. Above all, Event Delivery is designed to give you peace of mind that your data is making it where you want it, when you want it, and — if not — how you can fix the errors preventing this. For further information regarding Event Delivery, please visit the docs here or log in today to check it out. If you want to prevent errors from happening to begin with, you can use Segment’s Event Tester. With the Event Tester, you can test API calls and see the realtime response from a Destination partner’s API. For example, some APIs have particular requirements outlined in our docs, like the fact that you need to send along an email for email tools. The Event Tester catches these missing fields on the fly, letting you know that you need to add these fields to the API call in order for the Destination to successfully receive it. For further information regarding Event Tester, please visit the docs here or log in today to give it a whirl. The Event Tester can be accessed from the Source Debugger, or from your Destination settings. Event Delivery can be found in the ‘Event Delivery’ tab under your Destination settings. Because the Event Tester and Event Delivery features give visibility into what happens to your customer data between Segment and your Destinations, the receiving destinations need to be ingesting your data server-side in order to provide insight into your data deliverability. Using Segment, there are two possible ways to do this. The first is that you can send data into Segment using a server-side library ,like Node.js or Go. The second is that you can use our Connection Mode settings in the Segment app to make sure we are sending data to the receiving destination via Cloud Mode — which will send your data server-side out to the receiving destination — even if you are sending that same data into Segment via a client-side library. As the infrastructure for your customer data, we know it’s important to you that Segment isn’t a black box. The Event Tester and Event Delivery features will deliver more transparency into the platform, so you can spend less time searching for information and more time building product. To take a peek at your own delivery rates, log in here. If you’re new to Segment, request a demo to learn more about how you can get more visibility into your data pipeline.